Scientists see ripples of a particle-separating wave in primordial plasma, a key sign of quark-gluon plasma and evidence for a long-debated quantum phenomenon that's called a "chiral magnetic wave" rippling through the soup of quark-gluon plasma created in energetic particle smashups. 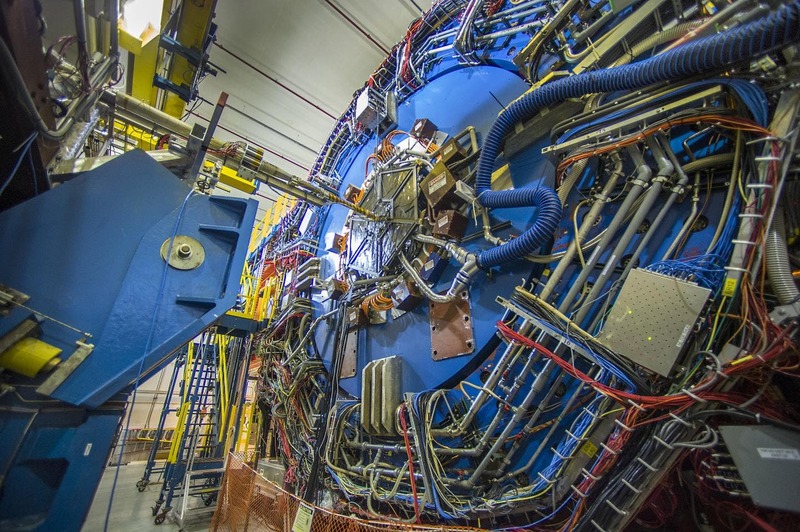 Scientists in the STAR collaboration at the Relativistic Heavy Ion Collider, a particle accelerator shown above exploring nuclear physics and the building blocks of matter at the U.S. Department of Energy's Brookhaven National Laboratory, have new evidence the magnetic wave. The presence of this wave is one of the consequences scientists were expecting to observe in the quark-gluon plasma–a state of matter that existed in the early universe when quarks and gluons, the building blocks of protons and neutrons, were free before becoming inextricably bound within those larger particles. 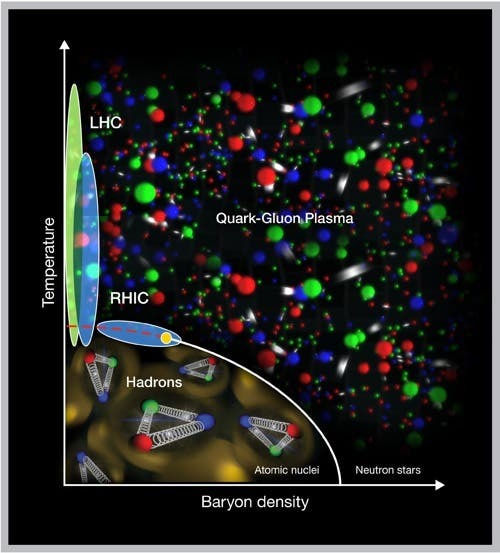 Studying the phase transitions of quark-gluon plasma shown in the image below allows us to understand the behavior of matter in the early universe, just fractions of a second after the Big Bang, as well as conditions that might exist inside neutron stars. The fact that these two disparate phenomena are related demonstrates just how deeply the cosmic and quantum worlds are intertwined. The tentative discovery, if confirmed, would provide additional evidence that RHIC's collisions of energetic gold ions recreate nucleus-size blobs of the fiery plasma thousands of times each second. It would also provide circumstantial evidence in support of a separate, long-debated quantum phenomenon required for the wave's existence. The findings are described in a paper that will be highlighted as an Editors' Suggestion in Physical Review Letters. "This 'chiral separation' acts like a seed that, in turn, causes particles with different charges to separate," Gang said. "That triggers even more chiral separation, and more charge separation, and so on–with the two effects building on one another like a wave, hence the name 'chiral magnetic wave.' In the end, what you see is that these two effects together will push more negative particles into the equator and the positive particles to the poles." To look for this effect, the STAR scientists measured the collective motion of certain positively and negatively charged particles produced in RHIC collisions. They found that the collective elliptic flow of the negatively charged particles–their tendency to flow out along the equator–was enhanced, while the elliptic flow of the positive particles was suppressed, resulting in a higher abundance of positive particles at the poles. Importantly, the difference in elliptic flow between positive and negative particles increased with the net charge density produced in RHIC collisions. "First, seeing evidence for the chiral magnetic wave means the elements required to create the wave must also exist in the quark-gluon plasma. One of these is the chiral magnetic effect–the quantum physics phenomenon that causes the electric charge separation along the axis of the magnetic field–which has been a hotly debated topic in physics. Evidence of the wave is evidence that the chiral magnetic effect also exists." Tang said. The chiral magnetic effect is also related to another intriguing observation at RHIC of more-localized charge separation within the quark-gluon plasma. So this new evidence of the wave provides circumstantial support for those earlier findings. Finally, Tang pointed out that the process resulting in propagation of the chiral magnetic wave requires that "chiral symmetry"–the independent identities of left- and right-handed particles–be "restored." "In the 'ground state' of quantum chromodynamics (QCD)–the theory that describes the fundamental interactions of quarks and gluons–chiral symmetry is broken, and left- and right-handed particles can transform into one another. So the chiral charge would be eliminated and you wouldn't see the propagation of the chiral magnetic wave," said nuclear theorist Dmitri Kharzeev, a physicist at Brookhaven and Stony Brook University. But QCD predicts that when quarks and gluons are deconfined, or set free from protons and neutrons as in a quark-gluon plasma, chiral symmetry is restored. So the observation of the chiral wave provides evidence for chiral symmetry restoration–a key signature that quark-gluon plasma has been created. Brookhaven physicist Zhangbu Xu, spokesperson for the STAR collaboration. "That would allow us to vary the strength of the initial magnetic field while keeping all other conditions essentially the same."